Got this as the 'kit' lens with my D200; and it is certainly the best lens I have for sharpness, etc.. Although I love my Sigma lenses, the Nikon quality just shines through... -- it's almost tactile: both in the product, and the resulting images: which need very little processing.... I should use this more...! "Another issue is BARREL DISTORTION at the wide angle..."
This has been my main 'walk-about' lens for four years now. I bought a D80 and this was the kit lens. For the price, it is a good lens. I would prefer the 17-55 F2.8 DX lens...but considering the 18-70mm is almost 1/4 the price...it is a good deal. Light fall off in the corners are the main concern with this lens. Once you get up to f8-9.5 it seems fine. Use of the vignetting tool in NX2 is highly reccomended for this lens. I'm no pro, but I've found the sharpness of this lens to be excellent. Another issue is pincushioning at the wide angle end of this lens. Personally I don't find this a problem (and even like the effect in some cases), though some photographers seem to find this a major problem. My style of shooting doesn't include a lot of buildings or interiors...Again, most Image manipulation programs will have a tool to help correct this. For the price I think this is a fine lens. For a pro or a photographer with pro aspirations...you'll want to look elsewhere...and spend more. Très bon objectif. Et bien meilleur qu'un 18/200 VR sur sa plage d'utilisation. Overall it is a very good lens. My recommendation: do not read tests, do not trust everything you hear or read. Go, get any lens you want for a day or two. Make your shots, take a close look and buy what makes good pictures. oh Yes ... as Tomek wrote, this lens is just a BASIC glass from Nikon gear but at least something for a first years of DSLR challenges,. Filters ... who cares, from this lens you simply CANNOT expect miracles ... cause it's useless :) It's a BASIC glass w/o any superb extra bonuses. Don't expect that the zoom would be FAST as much as you paid for this glass. I have been using the lens for full 3 years, now. It has very useble range so 95% of the time it is the right lens to use. Its performance is a mixed bag, I'd say. The focus is slow, slower than many people would wish. Not a big deal for a kit lens, you can live with it, but still... Another thing is the AF is not precise enough. One can argue that the lack of crispness can be the price for a depth of field but... I don't buy it. The best way to use the lens and be happy with image sharpness is to zoom-in to set focus just right, then zoom out and then shoot. Otherwise you will be scratching your heads what you did wrong. Using cheap filters does not help sharpness, too. Spend some $30 on a good multicoated UV filter. It won't hurt your budget but help image quality, definitely. 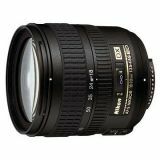 Other than that, the lens is OK and considering its price, it's a bargain, especially for a person who bought a cheaper Nikon DSLR with a basic kit 18-55. Hope it helps. Tom. A pretty sharp lens, at all apertures. This is the lens I use more often. One of the best lens i have used till date. Highly recommended. I bought it with my D70 as a kit lens. It's a good lens. para su precio resulta un objetivo versatil y de calidad. altamente recomendable.